Here's another shot from the Mission of San Juan Bautista. 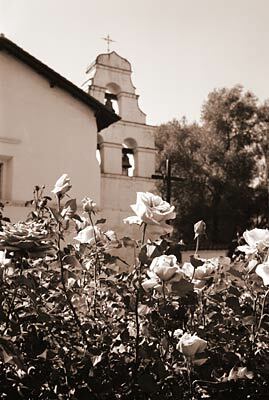 There is a beautiful rose garden near the bell tower of the mission with some of the largest roses I've ever seen. Some of the flowers were as big as soup plates. Photo taken with Kodak Medalist on Ilford Delta 100. Click for a larger view.